Was it worth it? Arguable. Arguable, because on one hand, I didn’t exactly get the robust kind of debate that should without question be expected of the caliber of candidates vying for the top job in a country like America. On the other hand, the debate helped affirm what some of us have observed since the beginning of the presidential race; only one candidate is prepared to be president, and Tuesday’s debate was a gross mismatch. And so it was, bright lights, a mix of audiences which included family, friends and supporters of the 2 presidential hopefuls and indeed the neutrals, the moderator and of course, one stage. The 2 candidates looked the part. And the debate began with the question regarding the candidates plan for America’s prosperity, with a focus on job creation. I must say that of the 3 categories of questions, this appeared to be the only part where there was really any semblance of a good debate, as the candidates differed on tax allocation and trade deals, and were able to discuss their plans for job creation to some extent. At this point, I had begun to be quite impressed with a seemingly subdued and composed Donald Trump, but apparently, I was too quick to assume that would be the case throughout the debate. Soon enough, the claws came out, verbal jibes were thrown, snide remarks, plenty of interruptions, and classic Trump revealed itself in all its glory. I was chatting with a colleague who had also stayed up to watch the debate. They expressed fears that Hillary would find it difficult to cope with her counterparts bullying, but I thought otherwise and opined as much. I was certain that Clinton’s camp would have done enough work on the 68-year old to prepare her for what to expect from her rival. Even for the neutrals who only understand so much about present day politics in the USA, it must have been evident that Trump’s approach would almost always involve an attempt to bully and even goad his opposite number into “submission,” or at least rile her up enough to commit gaffes. With Hillary, this strategy did not work. Every quip was met with a clear, lucid, well-thought-out response. When Trump tried to drag her in the mud, she was resolute and stood tall. Every insult was taken with a pinch of salt, and a look that would make even the most casual of viewers feel sorry for a man who appeared to be trapped in a little child’s body throwing tantrums and being petulant. And even, when the Republican presidential nominee threw up his “ace”- the dreaded email controversy that won’t just go away, Clinton was ready. She didn’t try to defend her actions, a move that would have gone awry then and there, and possibly buried her presidential aspirations once and for all. She simply took full responsibility for her indiscretion and apologized for it. I thought that was the most brilliant thing she did all night. Now, neither Trump, nor his camp would have guessed she would toe that path…the path of honour. And that singular admittance of “guilt” on Secretary Clinton’s part threw him off balance. His joker turned out to be useless. The Clinton-Trump debate was a tragicomedy, really. There were accusations and counter-accusations, verbal jabs and underhanded comments. There were several eye-opening and unbelievable moments during the debate. One of which was Trump’s interesting insinuation that he had a better temperament compared to Hillary. It was hilarious! Again, in an apparent display of hair-raising braggadocio, Trump referred to his tax evasion as smart! A presidential candidate of a first world nation… in a presidential debate which was beamed live to billions of people across the world, positing that evading tax represents the quality of smartness. I’m not sure anything else can be more shocking. When Clinton brought up the fact that her counterpart had stated at some point that he didn’t believe the climate change phenomenon, dismissing it as a hoax; in another barefaced lie Mr Trump claimed he never said that. Tweets negating his current claim have since surfaced to prove that he was being economical with the truth. The “Barrack Obama place of birth” controversy which was stirred up by the Republican candidate, and ended up being a false accusation couldn’t have also done much for his image. Let alone his sudden “concern” for African Americans. Now, while Hillary Clinton has had decades of experience in government having served as both senator and now secretary of state; not forgetting that she lived in the White House as wife of the president for 8 years, it’s obvious that she isn’t the most trusted American. Controversies have trailed her at different times, and some of the policies she supported in the past have proved to be questionable on the long run. That a section of Americans have a hard time accepting Clinton as genuine is not in doubt, and were it not for the fact that this presidential race is sadly lacking a worthy adversary, her dream of being the first female president of America would probably remain an unattainable fantasy. In a far more ideal situation, Hillary Clinton might not be the best choice for America. But, when your opponent is a far less viable option, then it’s safe to say your only competition is yourself. Except Trump does far better in articulating his policies, and not just attempting to shout down his co-debater in the two remaining debates, Americans just might have their president-in-waiting already. Away from politics in the United States, it’s imperative that Nigerians insist on a presidential debate where all candidates are present come 2019. Anyone who’s incapable of communicating their plans for the people of a country should have no business vying for the position of president. A robust debate is essential to enable the electorate get a good idea of what to expect from a government. Lol. That question is for the gods o! All I know is that the position at stake requires someone who’s calm, composed and serious. Thanks Bayo. If there was a debate between Buhari and Jonathan last year, maybe i wouldn’t have come out to vote in uncertainty. we need more like the one that just happened in Edo hosted by Channels. For some awkward reason i believe Trump knows what he’s doing. I’m thinking all his jabs are deliberate and the result is he has the media and is breathing down on Hillary’s neck in key battle states. Trump might be very unconventional but things are working for him. Won’t be surprised to see him in the White House in November. We definitely need a well organised debate come 2019, it will give many the opportunity to know the candidates better and hopefully make an informed choice. America is one country where anything can happen, and I wouldn’t bet that Trump can’t be president, even though I believe Hillary will win. Thanks so much Kunle. Thank you so much for your op-ed which first appeared in YNaija. As an American that is inundated with presidential election coverage, a US born citizen, wife and lover of world travel, ex military, medic, I have watched the presidential elections with interest for some time. It is so refreshing, eye opening, and with much interest that I read your opinion piece. 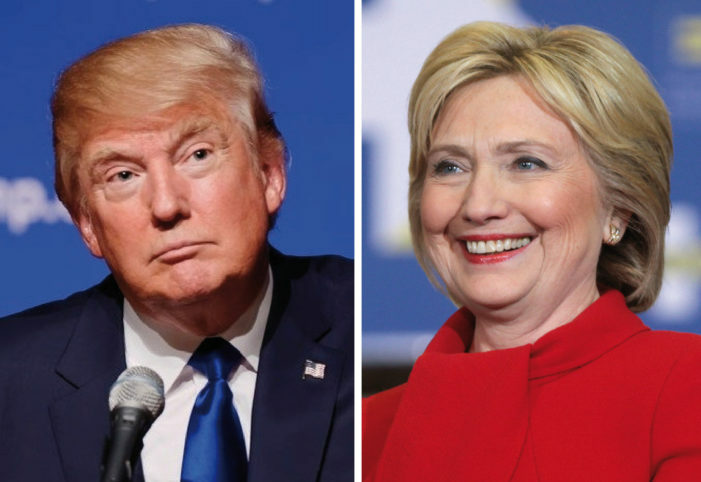 It appears to me that it is with common hope in a better world that has drawn us together to speak peaceably in regards to an upcoming event in our shared world history that has sparked my greatest respect for your very intelligent vision of the US presidential debate between the two front candidates, Hillary Clinton and Donald Trump. I state up front with respect and honesty that I do not agree with your candidate choice. It is my hope that you might consider a healthy debate of our own. The reason I am writing to you is because by your own words you are living in Nigeria, and with much interest you have even given up precious hours of sleep for speculation and involved interested in the politics of a Nation that shares a history with Africa and is currently involved in the politics of a great number of countries as leader and fellow heirs of the goodness that our world has to offer us. What a time to be alive! Such days as these do cause one to ponder the future, and remember the past with clouded love of days gone by. I think I could safely say that our differences of opinion could begin with the fact that we in America have not only watched the debates from the beginning, but we live them as well. I dare say, that if we were to compare, we would find that Africa is now only just beginning to experience some of the things which we, in America, have been experiencing for generations. But I’ll save that for another debate. I would just like to say that I believe there are currently (_ fill in the blank number of) people running for the presidential seat, two are qualified in their respective positions by virtue of the amount of money they are able to contrive, and a press corps that tells us what is best for us. The others we know very little about, as our press does not cover them at all. For example there are 3, third party candidates, on the ballot on all 50 states (see politics1.com/p2016.htm). There are 5, third party candidates, on less than 20 state ballots. There are 21 third party candidates, on less that five state ballots. Then, there is a list of no less than 400, (I lost count after 280) of independents, radicals, tea party, write-ins and extremists from all 50 states, designed with detracting and taking votes from the two main candidates, of which one, will be our next president. This is why in America, when Mr. Trump says the elections (the system is rigged) we believe him, because it is RIGGED! Not because there is some ”right wing conspiracy.“ You might see Hillary as qualified, I assume, because you have known her famously as the prior secretary of state, yada yada, on TV, in the news, in politics, now for decades. We too have been oppressed by the endless, non-stop political coverage of the Clintons. Not much of it very shining, either. Man did we put our hopes in Barak Obama when he beat out Ms. Clinton in 2008. Now that it is 2016, Barak Obama appears to me, to be an intellectual, who does not have the “feel of the people.” Oh he appears sincere and wanting to make a difference in the world. However, I watched as he spurned our allies, got to the top through questionable channels, (I mean which politician doesn’t? You either have to be rich or sell your soul.) He made laws that were not voted in, but made a fine name for himself. In a gesture of good will he brought Hillary Clinton in and I think even he is sorry for it, but he knows she will build on his legacy of “Obama Care, ” How is it helpful to fine people who can’t afford the Obama Care insurance, when they couldn’t afford health insurance in the first place? Mr. Trump has said, “Every American deserves access to high quality health care, not just insurance. Obama- care has failed on cost and quality of health care. It must be repealed.” (via Google search.) Hillary Clinton has lost her cool too many times to count, sort of like an actress, though, she knows the value of a good performance. Mr. Trump is not an actor or a politician, he’s still learning the game, he plays it like a businessman. In business as you probably well know, there are times to don the alpha male. All I know, is that when the majority assumes a mob mentality, as the press has, there is going to be a loser, maybe two. Here what Trump brings to the table in my most humble opinion. He knows business. Now just because he says out loud what others practice in secret doesn’t mean that what he is saying isn’t accurate. For someone who profits when someone loses his or her house or business, is in fact called business! It may not be pretty, but there it is. Banks profit too when they take your house. That’s why they gave low- interest rate loans to questionable buyers for years, when they knew that if the buyer defaulted, they’d still have a house. So I don’t know how it is in your country, but here, that is, as he says called “business.” I haven’t space her to debate the morality of it. Donald Trump knows business. Perhaps when I’m too loud or impassioned and speak before considering the listener. I believe that Mr. Trump will make a presidency that is lawful, because we are ripe in wanting a strong leader that knows the law and is prepared to make those that would break laws, accountable. Given the state of Ms. Clintons recent health scares, Mr. Trump appeared to be measured and because he does have a “feel of the people” he appeared to take it easy on her. I think you will see in the next two debates, an articulate Donald Trump, in a robust debate that gives any who are watching a good idea of what to expect from the next American President and coming government. It is my hope that we could meet one day and despite our differences, find akin, many traits and good fortune. Thank you especially, and all who find, interest in our elections, our country, in Africa and Nigeria, our future and our world. Hi Ellen. I’d first of all like to say a big thank you for reading and taking the time out to respond to this article in such an explicit manner. I am so glad to have the perspective of one who not only resides in the USA, but has also keenly followed the presidential race. The article was first published here however, and then on YNaija. It’s also interesting to have a very good idea of what makes the average Trump supporter support him. I have always speculated on what could make anyone want to vote for Donald Trump, but you have given great insight into the reason…at least speaking for yourself and a number of others. I get your point when you refer to Trump’s brutal honesty and business-like mind, it’s a quality that’s almost non existent in the average politician. All the same, when one has to address billions of people around the world, there should be some measure of tact employed. Again, the Republican candidate certainly did most of the interrupting on Tuesday. Those who counted claim he did 28 times! But that’s just by the way. I am not one of those who deride Donald Trump’s supporters, but I really don’t think he is mature and tactful enough to handle a post as sensitive as president. There are so many other areas I’d have loved to engaged you on, but time and space won’t permit. Make no mistake though, I have learned a lot from your views and hope we can meet as you have said to discuss things further some time in the future. Thanks once again Ellen, and plenty of love from Nigeria. Oh, I am so sorry, did I give you the idea that I am a Trump supporter? ; ) I certainly am not. At least, I am still one of the hopeless undecided whom, with all of the choices, may write in a wanted candidate and let the lot fall where it may. I have put my futures hope, in the hands of providence, on numerous occasions and have found that things usually turn out for the best (sooner or later.) I only know who I certainly will not vote for! I am curious how you get your news regarding Ms. Clinton. I beg you to not rely on the Media. One reason that I lean toward the Donald, or lean away from Hillary Clinton, rather, is due to her associations, and profiteering from Planned Parenthood! I cannot agree with a policy that does not allow rights and liberty to the unborn. I do not cast judgement on any woman that has made this option a choice for her life. After all, if your society, government, maybe family and friends, say that it is legal and it appears to be a solution, to an unplanned woman in crisis, of course it seems a sensible choice. But I cannot, in the 21st century say that “child-sacrifice-for-profit and abortion-as-birth-control” (for that is what it has become,) is an acceptable way to conduct our society. That is my personal opinion and nobody asked me, but there it is. Did you know that Margaret Sanger (The mother of Planned Parenthood) said regarding blacks, immigrants and indigents: “…human weeds, reckless breeders” spawning…human beings who never should have been born.” “Margaret Sanger, Pivot of Civilization.” She also said other worse things too. Thank you for taking the time to listen. I like your mind and your hospitality. A trillion blessings wished! Can’t thank you enough Ellen. A number of things you have “exposed” here is actually news to me, and certainly agree with you on the planned parenthood policy. America going into a recession will be a disaster, and I really hope it doesn’t happen. The effects of the recession my country is currently can best be imagined…let’s just say there have been better times. Of course I know it’s dangerous to depend solely on the media for news, which is why I try to do some independent research. However, I cannot claim to know better than one who lives in the midst of all the “action”. Been really nice having this virtual discourse with you. Wish you the same blessings too. P.S. I agree with your assessment of Mr. Trump. He acts petulant and impulsive and without regard for listeners around the globe. His position on the abortion issue is, he says, he used to be pro-abortion, now he says he is pro-life. Time will tell if we can believe what he says.